Yesterday the United Nations voted an overwhelming 128-9 to condemn the United States’ recent recognition of Jerusalem as the capital of Israel. 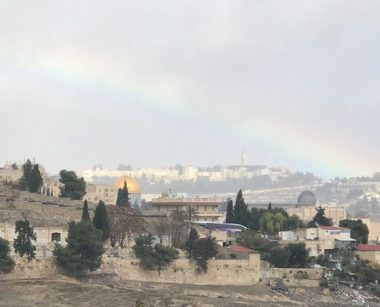 (Hours after that recognition, I took the photo you see of a rare rainbow over Jerusalem.) The subsequent UN vote just so happened to occur on December 21, literally the darkest day of the year. It was also the day after Hanukkah, which commemorates light shining amid darkness. In light of this calendar coincidence (pun intended) some key takeaways and prayer points emerge. To what extent will the UN or any related coalition seek to enforce these decrees? Below is an excerpt from our December 8 “Reflections” post. In it is a personal story with suggested directions for prayer. Fourth, keep in mind that Zechariah chapter 12 includes a powerful prophetic passage describing Israel’s deliverance, repentance and restoration. When the nations surround Jerusalem as a burdensome stone, God supernaturally strengthens His people. He is victorious on their behalf, leading to widespread repentance—and revival-like revelation of Messiah. Come to think of it, isn’t birthing new life much of what Christmas is all about? To all who celebrate Messiah’s Incarnation this December 25, a very blessed Christmas to you.